Get a new look for your bathroom or kitchen that’s also energy-efficient and water-efficient. Our designer showroom has everything you need for the plumbing services of any remodel, including high-end kitchens and bathrooms. 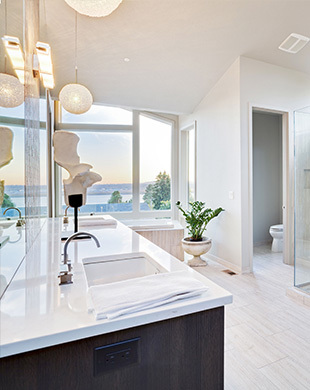 The experienced professionals at Bruesewitz Plumbing will assist you in all phases of your remodel until completion. At Bruesewtiz Plumbing of Burlington, WI, we offer you not only plumbing services but complete design services. We take care of everything from the drywall to custom cabinets for your remodel. Visit our designer showroom to get an idea of how beautiful your home can look. Whether you have a personal or commercial remodel, Bruesewitz has the team to get the job done with beautiful results you’ll love.